As we potentially watch Scotland sail away into the uncharted waters of the devolved EU nation state, there seems to be other traditionally tightly controlled territories being set adrift with little direction. Or rhyme or reason. One of the most impressive examples of straight-forward directionlessness must be this story about Visa which caught my eye today in a back issue of New Media Age. The credit card company has decided to buy some “land” in second life but as reported here, they wouldn’t want to be so ostentatious as to actually do anything so are asking users or their views on how the land should be used. Sandra Alzetta, senior VP of innovation at Visa says: “Visa has approached Second Life in the interactive manner of the world itself. What we have created is very much a work in progress which we are hoping to see grow through user participation, we are looking for visitors to our island and our member banks to input into our presence in their world”. 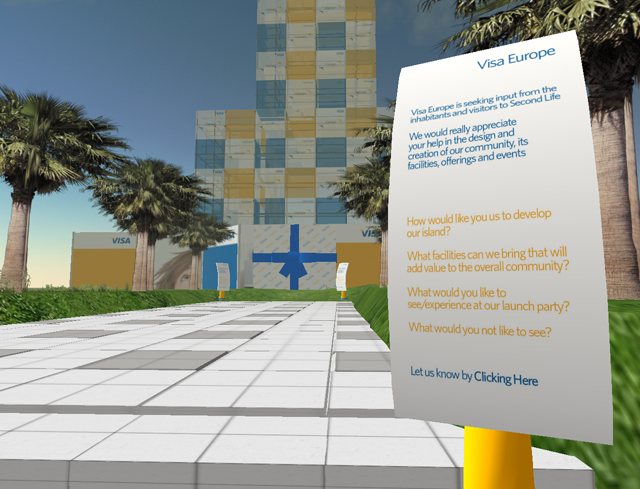 (picture of Visa’s empty space in Second Life).